WASHINGTON -- President Barack Obama and President-elect Donald Trump met at the White House Thursday. Obama called the meeting "excellent," and his successor said he looked forward to receiving the outgoing president's "counsel." Trump also said he "very much looks forward" to dealing with Obama and called their meeting a "great honor." 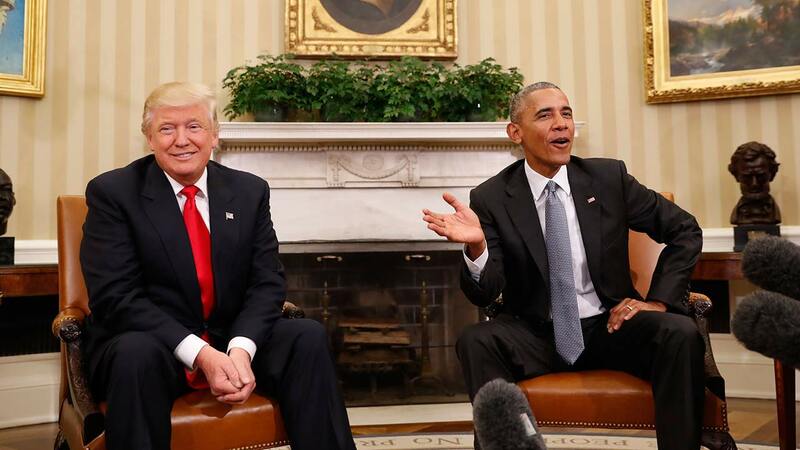 Trump noted that he and Obama haven't met each other before. Their meeting lasted well over an hour. Trump said that Obama explained "some of the difficulties" but also "some of the really great things that have been achieved." This is the first time Obama and Trump have met face-to-face, according to a White House official. Their last interaction was at the White House Correspondents' Association dinner in 2011, when Obama relentlessly mocked Trump, who had then been fanning the flames of the so-called "birther" conspiracy. Also Thursday, first lady Michelle Obama and future first lady Melania Trump met in the White House residence. President-elect Donald Trump's shocking victory in the 2016 election will bring a new first family to the White House. This is Mrs. Trump's first trip to the White House, but not for Donald Trump who visited in November 1987 for a reception for members of the "Friends of Art and Preservation in Embassies" Foundation, and also in 1985 with his first wife Ivanka for a state dinner for King Fahd of Saudi Arabia.